ROUTE – Ride leaves from 703 Pacific Ave – The Bike Church (entrance on Spruce Street). Head back towards downtown. Do a lap or two through downtown. 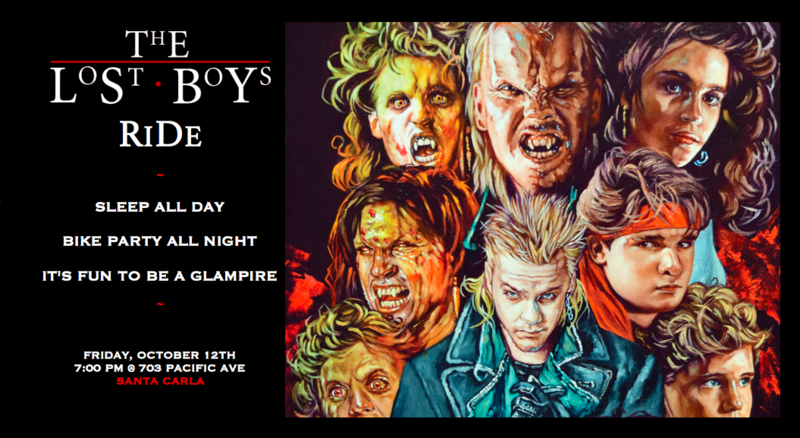 In the spirit of Lost Boys, Halloween, big hair, and Santa Cruz as a horror film location, release your inner vampire, glampire, vampire hunter, killer klown from outer space, or other creature of the night. Meet at the Santa Carla Bike Church, I mean mortuary, at 7pm. Ride leaves at 7:15.